The STFB annual membership meeting at Historic White Hall in Spring Hill was an enjoyable and motivating evening with 38 members and guests in attendance. After a fine dinner served by White Hall owners Jean and Joe Ed Gaddes, the STFB business meeting was called to order by President Greg Wade. A recap of the past year’s activities was presented by Vice President Chris Cuomo. Secretary Sam Gant conducted elections in which the only board member up for reelection, Michael Walker was reelected. The business meeting was then concluded and Greg introduced our speaker, Robert Hicks of Franklin’s Charge. Robert spoke on Battlefield preservation in Franklin and Williamson County and the urgency for each of us to take action. As president of Franklin’s Charge, Robert led the effort to reclaim the Eastern Flank battlefield park, formerly a Golf-course. Recently Franklin’s Charge has acquired the Carter Gin site across Columbia Ave from the Carter House. Robert spoke in moving terms of the stones from the Cleburne Cenotaph, the only 19th century memorial recognizing the Battle of Franklin, which are now relegated to the foundation of a house on the property. Certainly, those who fought deserve a better memorial. Franklin’s Charge plans to reconstruct the Cleburne Cenotaph using those original stones. However, Robert made clear the urgent need for funds to pay off the note on the property, restore the cenotaph, as well as other work to be done elsewhere. The work to pass on to the next generation the memory of the battle and those who sacrificed needs each of us. The evening was concluded with Greg Wade presenting Robert with the Tennie Pinkerton Dozier Award, presented annually by STFB for outstanding work in local preservation. Dozier was a pioneer in preservation efforts in Franklin in the 1890’s. We thank Robert for his motivating talk and for his tireless efforts for battlefield preservation in Franklin. 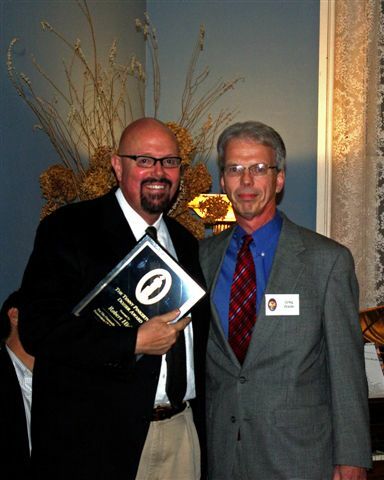 Robert Hicks is presented the 2008 Tennie Pinkerton Dozier Award by President Greg Wade.